One true sign of Christmas in our home is the Christmas Tree and my whipping out Candy Canes to decorate and give away! 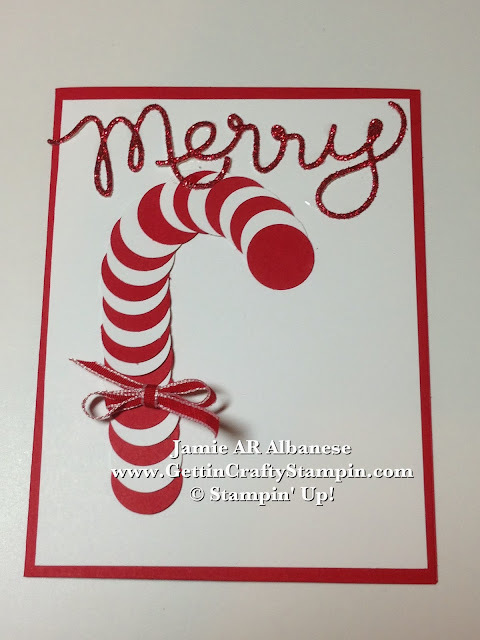 So when I thought of a fun and quick card this Christmas season... out came this idea with a nod to our holiday treat! 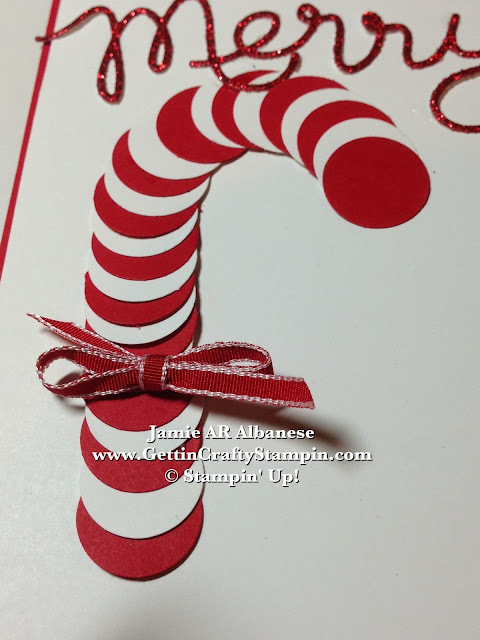 Simply punch out these sweet circles in Real Red and Whisper White card stocks... layer over each other to create this candy cane look. Using my SNAIL (Simple, Neat, Affordable, In-Line) adhesive to hold one onto another. This is a fast and fun card to create. 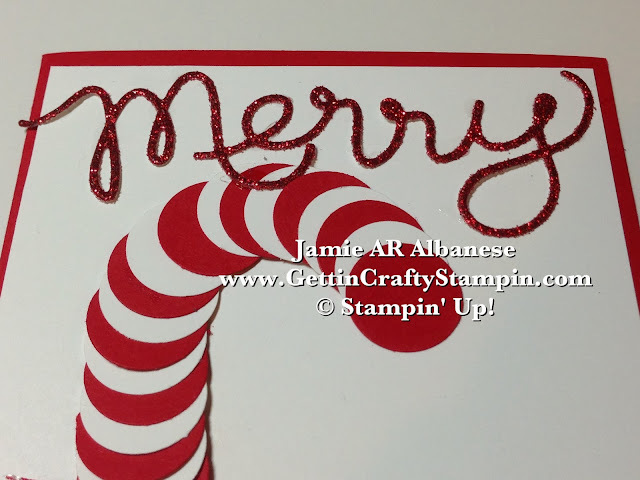 Using the Big Shot Die-Cutting Machine and Expressions Thinlits with this Red Glimmer Paper. I love the pop of glimmer and shine! Adhere with the Crystal Effects liquid glue for a clear and quick application to this delicate scrolled 'Merry'. Tied together... wrapping a sweet Real Red Taffeta Ribbon is a great way to mimic the sweet gift it is. What brings to mind the Holidays to you and your family? Hot Cocoa with a Candy Cane addition/stir stick?? Yes, please!! It's so sweet that you came by today. Please come back and visit often. I try to post daily and hope you will come by often and bring your family and friends to play along! This sweet candy is sure to wish a 'Merry' day to whomever receives it! 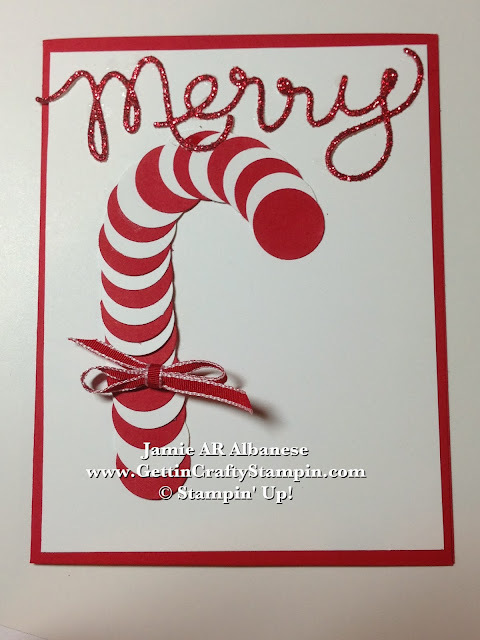 Celebrate and create this Christmas... a quick card that is sweet and has a dash of bling? It's the perfect recipe for this busy season. Send a hand-stamped or Punch Art card this Christmas for some sweet memories!